WonderCon 2017 will be held March 31–April 2 at the Anaheim Convention Center in Anaheim, CA. If you're interested in exhibiting, please click here to download the WonderCon 2017 Exhibitor Application. Please note: Submission of an exhibitor application is not a guarantee of space. WonderCon 2016's Small Press Area will offer some of the very best in comics, art, prints, and books being published today. Here's our complete list for the Small Press Area, including table numbers and a location map. 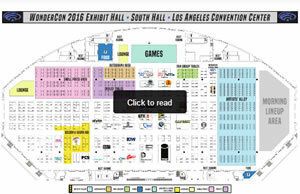 Click on the Exhibit Hall dropdown menu above to access Artists' Alley, Exhibitors, and Fan Tables.